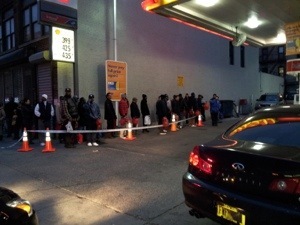 See photos of long lines at gas stations along 145th Street in Harlem | HarlemGal Inc. Soon after I blogged about the Harlem gas station on 110th Street and FDB posting a sign saying “no gas,” comments have come strolling in on Facebook and via email. 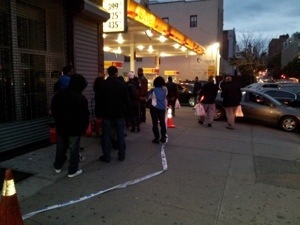 At 9 pm this evening (November 1), a reader sent in pictures of what’s happening at the gas stations along 145th Street between Lenox Avenue and FDB. 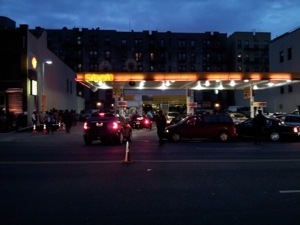 According to the reader, the lines for gas are four to five blocks long and for one Shell station near Pathmark at 145th Street, the line of cars extend around the corner to FDB then down three blocks to 142 Street. 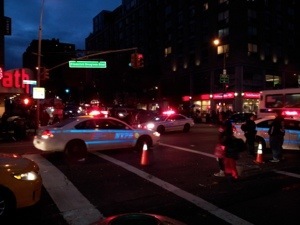 The reader also states police are detouring traffic across 145th St. because of the long gas lines. For several days now, the main stream media has been reporting that gas supplies are limited and can’t be delivered due to the port of NYC being closed. The result is long gas lines everywhere. And people are also buying fuel for generators. Take a look at the photos the reader sent in. And a big thank to the reader for keeping us informed on the gas situation! This entry was posted in Community, Harlem, spending and tagged aviation, Cars, facebook, gas, gas ration, gas stations, Harlem, Hurricane Sandy, shell station, transportation. Bookmark the permalink. They are good photos. I would love to take the credit, but I can’t. wink, wink.